In Japan, the time period of January is called “o-shou-ga-tsu, Oshougatsu in Japan is an event for the family, much like Chinese New Year. Most Japanese people will be at home with their families come together to celebrate the New Year. The o-souji ritual used to start on December. It has a practical and a spiritual significance. 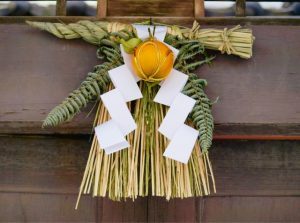 This major house cleaning is thought as a ritual to give a pleasant welcome to God on New Year’s Day.They will associate a big annual clean with spring, in Japan it’s done in the last days of the year – pretty much everywhere. Homes, schools and offices all get a thorough going over that creates a clean slate for the year ahead. After finish the house cleaning, it will start to decorate their houses with special decorations on December 28th and 30th. Please be carefully they would not do it on December 29th because that is apparently also not a good day to put up decorations because the number nine has the same sound as “suffer” (ku 苦) in Japanese, so it is also considered to be bad luck. Let’s get to know the different Japanese new year decorations! 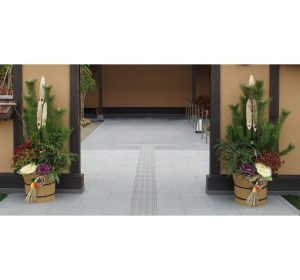 Kadomatsu are placed in pairs in front of the gate or front doors of homes to welcome the Shinto gods. Shimekazari will put it on top of the house entrance to prevent bad spirits from entering and to invite the Shinto deity, to descend and visit. Japanese people will and place these at very visible places around their homes for decoration. Placing them in different rooms is said to bring more luck, as each room will welcome Shinto gods come and stay. People say ”あけましておめでとうございます(akemashite omedetou (gozaimasu)” which is meaning congratulations on the new year. 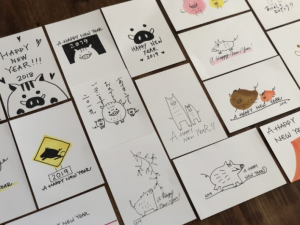 They will send New Year’s cards called ”nengajo ”to their family or someone treated well by. Although with the growth of the Internet and cell phones, the number of people who send nengajo is decreasing yearly, The receiver can know your feeling during you hand writing. However, do not send the New Year’s cards to anyone who has had a death in the family during the year. New Year’s Eve is called “Oomisoka” in Japanese. At Buddhist temples, huge bells are hit 108 times during midnight to get rid of all evil desires. 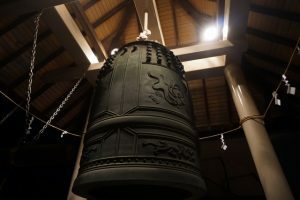 Most people believe that huge bells are hit 108 times during midnight to get rid of all evil desires. 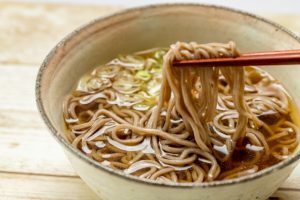 So that we will eat the “toshikoshi soba” when we hearing the huge bells sounds and wish for a long lasting life. You can still listen the huge bells sounds even while you’re staying at home because you can see it at the TV shows. 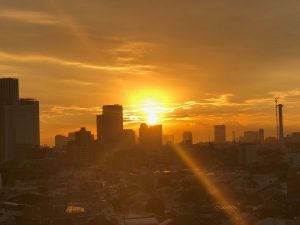 It is an event to worship the first sun rising on New Year’s Day, which is the beginning of the year since it is believed that the Shinto gods of the year appear with the first sunrise. So, people pray for good luck when the first sun rises. 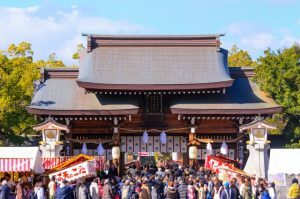 At the beginning of the year, people go to the shrine and pray for the safety and happiness of the new year. Some people leave their home to visit the shrine on the night of the 31st, or at the midnight, and some people just go there in the morning on January 1st or afternoon. Shrines are very crowded at this time of year. The money which you can put into the wooden box for good luck is well known as the more money you put into it, the more luck you will get. On the other hands, some people believe if you put 5 Yen, it is super lucky. 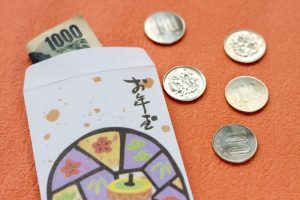 Since the pronunciation of 5 Yen which is ‘go en’ sounds similar to the word ‘ご縁(go en)’ which means luck. 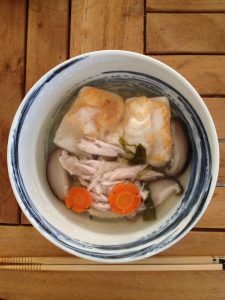 It is a celebration meal that Japanese people have between January 1st and 3rd. 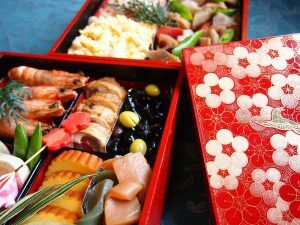 Japanese people believe that Osechi dishes bring good luck in the sense of celebration. It is filled with grilled, boiled and pickled foods in a multitiered Japanese food box. It is made up of dishes which could be preserved longer time so that it can allow housewives who are busy with cooking take a rest around some days at the New Year. Originally, this began with the custom to give some left over rice cakes to children. but today it has become an event for adults to give money to children. It’s a small bag of money that children receive from their parents, grandfathers, grandmothers and relatives. 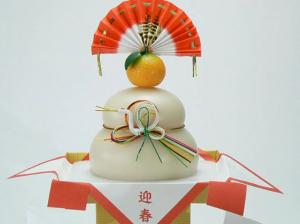 You should eat Kagami-mochi which were offered to the Shinto gods after some days from the New Year day! 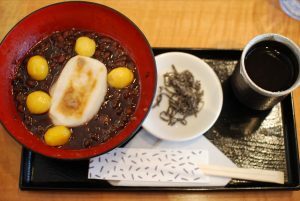 People cut this rice cakes and put them into some red bean soup or Ozoni which is Dashi soup(Soup types and other ingredients might be changed up to the location.). They eat this praying for keeping good health of the new year. People eat this mostly on January 11th or 20th.